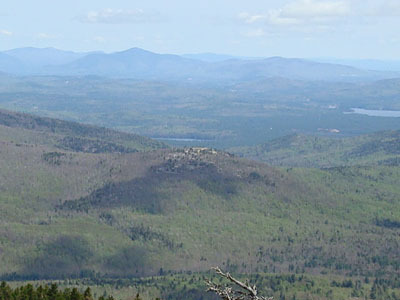 Bayle Mountain is a scenic peak located in the center of the Ossipee Mountains. Its ledgy summit features views in all directions. Though featuring a trail that was protected with Federal tax dollars as a maintained hiking trail with guaranteed public access, the mountain was closed for much of 2009 due to alleged, yet undocumented destruction by users. The Bayle Mountain Trail was reopened in December 2009 with heavy restrictions. The only trail that leads to the summit of Bayle Mountain is a trail unofficially known as the Bayle Mountain Trail, which can be accessed via the snowmobile trail that crosses Marble Road (decent dirt road) and passes near Bayle Mountain Road (rough).